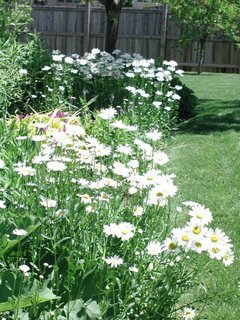 These are some daisies blooming throughout the perennial garden right now and I have chosen them as my "flower of the week". I like these particular daisies and let them somewhat naturalize themselves throughout the garden. They do a good job of filling in blank spaces and help tie the whole garden together. They aren't as invasive as a lot of plants, and are easy to weed out in the early spring if they get too rambunctious. I cut them back after the first full bloom and then they bloom off and on through the summer. I'll admit that I don't know if these came from seeds, or if I bought plants, or if someone gave them to me. Nor do I know the specific variety. I have records of the seeds I've sown going back to 2000 and don't see these listed. But, since I can't remember anyone giving them to me, nor can I remember buying them, I would guess I started these daisies from seed "pre-2000". So, do I keep a lot of records about the garden, you ask? Well, I keep more records than some people, but certainly not as many records as others do. I catch myself, too often, thinking as I plant that I won't need to put a label with a new plant because "of course I'll remember what it is". And for some plants, at least for the first season, I do remember. Then comes the long winter, and spring, and oops! I forgot. - a 10 year gardening journal started in 2001. There is a page for each day, and a place for 10 years worth of notes on each page. I'm on the 6th year. I like to look back and see when plants bloomed, when I planted different things, when the lawn service came, when I mowed the grass and the high and low temperature for each day. So, when I finish this journal, I'll start another one. - a list of the seeds I plant each year, usually done on an Excel spreadsheet. - a box of receipts from various nurseries. - a bulletin board in the garage where I've tacked up all the plant labels from any trees, shrubs, or perennials that I've planted. It's full, so I need to go through and take off some of the tags for plants that died on me or disappeared. I might just move them to a "memorial board" or maybe but them on a board marked "missing", in case any of them mysteriously re-appear! To be fair, I probably also need a board for "banished" for those plants I planted and shouldn't have and spent a lot of time getting rid of! (Moneywort, variegated artemesia, chocolate mint, etc.) Anyway, it's easy to run into the garage and look at the bulletin board to find the name of a particular plant that I've forgotten. At one time, a few years ago, I had the big idea of listing every plant I had on a spreadsheet. I started off with the labels and then my plan was to go around the yard to list what I didn't have labels for. Well, I did get as far as entering the information from all the labels into a spreadsheet, but didn't fill in the blanks on what I didn't have labels for, so I abandoned that project. It was feeling too much like work, and was taking too much time away from "just gardening"!